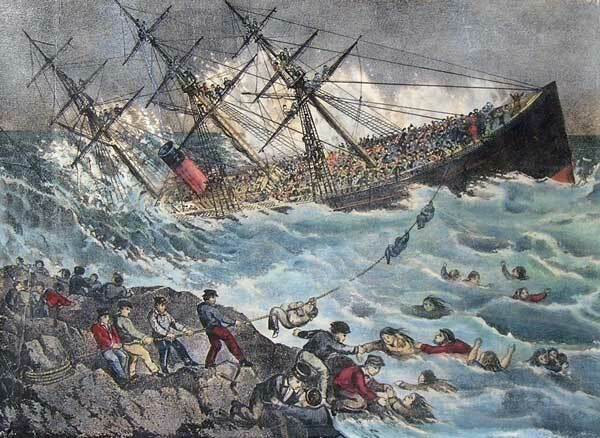 I continue to be amazed by the sheer number – and scale – of shipping disasters in the 19th Century and many have been described previously in this blog. It’s notable that in so many cases the “accidents” were avoidable and attention to even the most basic precautions would have averted them. Unwillingness to provide adequate lifeboats was to be a common feature up to the Titanic sinking in 1912, but many other tragedies resulted from sheer bad seamanship. It’s also probable that the custom of recruiting crews for short periods – often only a single voyage – mitigated against formation of efficient teams that worked together over long periods. Working and accommodated in often-atrocious conditions, and poorly paid, the merchant-seamen of the period must have had very little identification with their ships. It’s notable that in the same era there were relatively few losses in the Royal Navy. On many occasions indeed, naval ships survived conditions that would have doomed civilian vessels, the cohesion, discipline and esprit de corps of the naval crews being worth diamonds in extreme situations. These musings were prompted by reading a Victorian-era account of the wreck of the 3700-ton RMS Atlantic, a liner belonging to the famed White Star Line which would later own the Titanic. When she came into service in 1871 this ship was one of the fastest and most luxurious afloat. 420-feet long, and driven at a maximum of 14.5 knots by her single-shaft 600-hp engine, she carried auxiliary sails on four masts – the back-up to steam that was still essential in this period. With the “RMS” identifying her as authorised to carry Royal Mail, the Atlantic was employed on the prestigious Liverpool-New York route “with wonderful regularity”, and with capacity for 1166 passengers in addition to her crew. 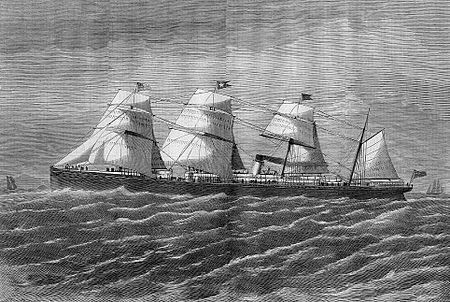 In March 1873 the Atlantic set out on her nineteenth voyage to the United States with 835 passengers – many of them emigrants – and 117 crew on board. Stormy weather was encountered from the start and this caused such heavy consumption of coal that the Atlantic’s Captain Williams decided to head for Halifax, Nova Scotia, to replenish his bunkers before pressing on to New York. On the evening of March 31st, the Atlanticwas within some dozen miles of Halifax and stormy conditions were continuing. Williams decided to put off entering harbour until daylight and in the meantime the ship was set on a southerly course. At midnight he retired to rest in the chart-room, leaving instructions for the officer of the watch to call him at three o’clock. The first officer had apparently also retired, leaving the vessel in charge of the second and third officers. Despite proximity to a dangerous coast, they did not take soundings, or post a masthead lookout, or reduce speed. They failed to spot the Sambro Lighthouse to the south of Halifax’s harbour entrance. The Atlantic was aground some fifty yards from a large rock, itself lying about a hundred and fifty yards from an island behind. 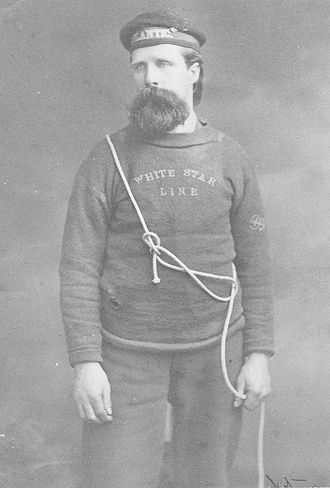 The third officer, named Brady, and two seamen braved the waters and managed to get five lines across to the nearer rock. A single rope was then passed from this rock to the island behind. The courage of the men who managed this must have been superhuman. A photograph of one of these heroes survives, Quartermaster John Speakman. An appalling choice now confronted the survivors on deck – stay on the doomed ship or risk passage through the raging surf along the ropes to the rock and island. “Of those who made their way to the deck, or clambered into the rigging, tens and scores were washed away by the inrush of waters. The fore-boom broke loose and, swinging to and fro, crushed the unfortunates who chanced to be within its range. Then, again, there were not a few who, in a sudden frenzy, threw themselves headlong into the sea, and were carried out of sight in a moment.” About two hundred people managed to gain the rock along the ropes and fifty of them reached the coast beyond. The Second Officer, named Frith, was still on board with thirty-two passengers, one of them a lady, and they had climbed up into the rigging of the mizzen mast. Some were rescued by boat, others were washed away, until at last only Frith remained with the lady and a boy. The storm had worsened and the boats could no longer approach closely. 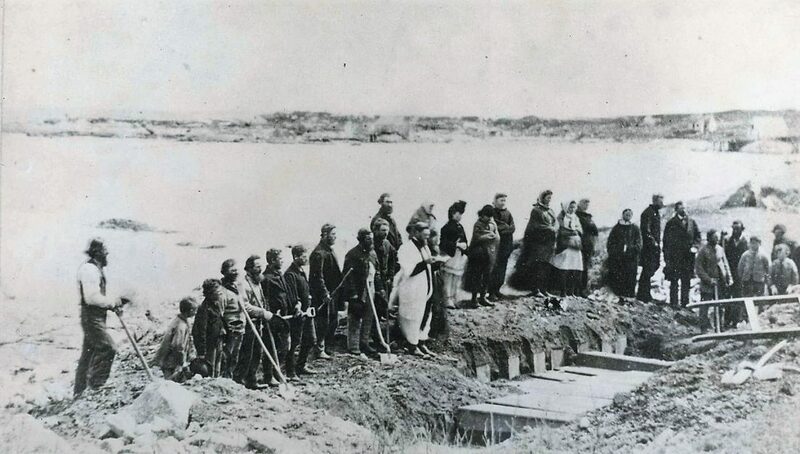 Washed away by the waves, the boy managed to reach a boat but the lady was held tight by Frith – one can imagine that with the female clothing of the period survival in the water would have been impossible. A local clergyman, named Mr. Ancient (a wonderful name! ), had arrived in a small boat with four volunteers and they now made one last attempt to rescue Frith and the lady. By the time the boat reached the ship this unfortunate woman had succumbed to cold and it proved impossible to reach the mizzen mast where Frith was stranded. Ancient did manage however to get a footing in the rigging of the main mast and threw a rope across to Frith, who was dragged back by it and then brought to shore by boat. There were 371 survivors. All 156 women and 189 children on board died, the only surviving child being the twelve-year-old boy whom Frith had stood by. Ten crew members were lost, while 131 survived (there appears to be some uncertainty as to numbers). The courage of the islanders – not least Mr. Ancient – who came to the rescue and who cared for the survivors afterwards was beyond praise. There can be little doubt that neglect of proper precautions when so close to a dangerous coast led to the disaster. A subsequent court of enquiry resulted in Captain Williams being “severely censured” but in view of is courage and his efforts to save lives, his captain’s certificate (“ticket”) was suspended for only two years. One wonders what became of him afterwards. Did he perhaps become like Conrad’s Lord Jim, haunted by his failure and striving to make amends? Perhaps some of the readers of this article may know.